The Santa Cruz community is no stranger to the housing crisis — issues of high rent, tenants’ rights and a disproportionately high houseless population frequently appear in City Council meeting agendas and public discussions. 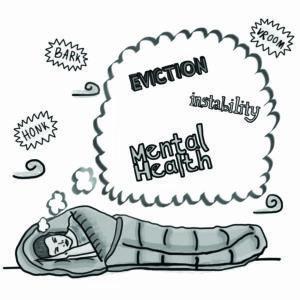 Less frequently discussed are the accompanying issues of mental health within houseless communities and communities of people experiencing housing insecurity. In Santa Cruz, 54 percent of people who experience “chronic homelessness,” also suffer from some kind of psychiatric or emotional condition, according to the 2015 Point-in-Time Survey. The same study found 58 percent of houseless residents suffer from drug or alcohol abuse. This reflects a national issue — 46 percent of the houseless population living in shelters is dealing with severe mental health issues and substance abuse. The Mental Health Client Action Network (MHCAN) helps Santa Cruz residents with conditions such as these by providing resources, addiction recovery programs and a community space. About 40 percent of the people they serve are houseless, said MHCAN executive director and mental health counselor Sarah Leonard. “About […] a third of the people [we serve] who are homeless are temporarily homeless and are moving in and out of places due to their psychiatric disability [or] history of trauma,” Leonard said. For some, the challenge of balancing mental health issues and other responsibilities leads to housing struggles. For others, housing situations is what initially triggers mental illness. Co-founder of Food Not Bombs Keith McHenry explained that, through his program, he has interacted with houseless residents who entered housing insecurity with little to no mental health issues, but experienced extreme emotional distress during the months leading up to the streets. “I’ve met a lot of people on their first day of living without a house look like they were in a war or something, just shell-shocked,” McHenry said. Eventually, distress from transitioning to life on the streets can lead to bigger mental health issues. These challenges include changes in environment and sleeping patterns, both of which can be extremely detrimental to a person’s psychiatric and emotional health. “I’ve been woken up 18 times in one night. It was like clockwork. I mean, I wouldn’t even go to sleep and they’d wake me up again and wake me up again,” said a houseless resident and U.S. veteran who goes by the name Irish. Beyond mental health issues related to sleep deprivation, houseless people can also face anxiety from constantly watching over their belongings. Warming Center director Brent Adams said when a houseless person loses their possessions, their mental health is severely impacted. “We’re always hearing that their bag was stolen and all their medications were in it, their ID was in it, their medical cards were in it. It’s a complete catastrophe where someone was totally on their game and all of the sudden they are lost,” Adams said. Self-medication is a common coping mechanism for the harsh conditions houseless residents face, Adams said. Self-medication is when an individual chooses to use an unprescribed and sometimes illegal substance to alleviate physical or mental pain and can lead to substance abuse. This happens more often when an individual is self-medicating with drugs like methamphetamine, heroin or alcohol. “It becomes cheaper to use heroin or meth than it is to get a hotel room or get an apartment and that of course can be really damaging to people’s mental health,” Keith McHenry said. For about 30 percent of the houseless residents MHCAN serves, their main disability has to do with drug and alcohol addiction, according to executive director Sarah Leonard. This, coupled with mental health issues, she said, is often the reason they are on the streets. The resources available in Santa Cruz are vastly underfunded and understaffed, Adams and McHenry said. This lack of accessibility and programs, from mental health services to adequate shelters and affordable housing contributes to the cycle of mental illness in the houseless community. While MHCAN provides a number of programs designed to help individuals experiencing mental health issues and forms of addiction, the city only allows it to serve 50 people each day. Leonard attributes this and other restrictions to the discrimination and stigmatization of the mental health community. “We, [the mental health community], are still stigmatized and discriminated against in a way that many other populations that have been identified as target groups are not, or when they are it’s recognized,” said Leonard, who also deals with mental health issues. Leonard wishes MCHAN was able to offer more mental health resources, especially because they are so desperately needed in a community frequently overlooked, she said. Resources for houseless residents are also rarely prioritized in government budgets and these services also remain inadequate, according to Adams and McHenry. Irish, like many other houseless residents, feels personally discriminated against by the general community. “I get judged everyday. I get people who look down on me, down their nose,” he said. Both stigmatization and marginalization of the houseless population factors into the Santa Cruz community’s lack of conversation surrounding mental health within this community. Houseless advocates and mental health officials alike emphasized that houselessness and mental health are interconnected, and more resources should be available in order to support Santa Cruz residents who are caught in between these two issues.